Any Hats in Your History? Little Mennonite girls could be fancy before they became plain. They could wear hats. Their mothers may have worn flat, black bonnets on top of their prayer veilings (coverings) at Easter, but they couldn’t wear hats with ribbons and flowers. At least not in Lancaster County, Pennsylvania in the 1950s. 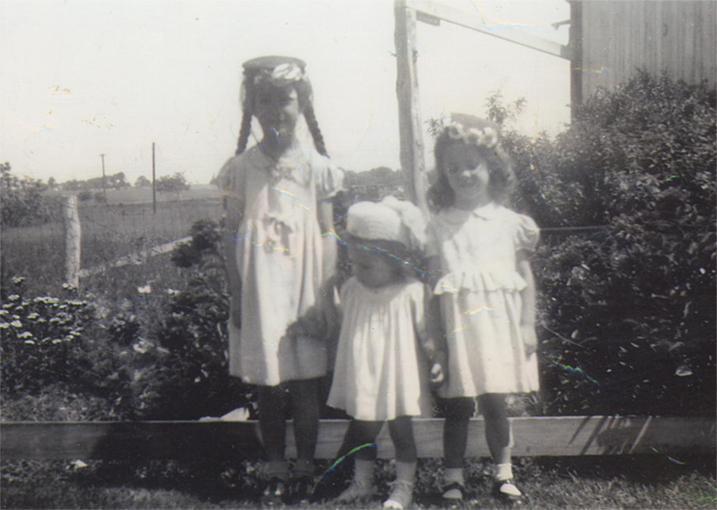 My sisters and I are standing here in front of peony bushes wearing some cast-off hats Grandma Longenecker’s friend, Mame Goss, brought from a millinery shop in Middletown, Pennsylvania. I’m looking now at a snapshot my mother took of my sisters and me in these hats, the three of us holding hands in front of a peony bed. The magenta peonies are in bloom, so it must have been May. The double whites mingled among them have ruby flecks in their ruffled centers. My sister Janice, three years younger, is standing at one end, with blonde hair fluffed into curls, hands obediently at her side. Jeanie, a tiny tot of two or three, appears to be looking down at the grass, her burst of tulle brushing light brown hair. I’m staring straight at the camera, two thick braids trailing down my back. Our dresses are all bedecked with ruffles and bows, embroidery or smocking, dresses surely made by our plain Mennonite mother. I wore my first adult hat ever, a pale blue clôche with a blue chiffon dress one spring when Cliff and I were dating. 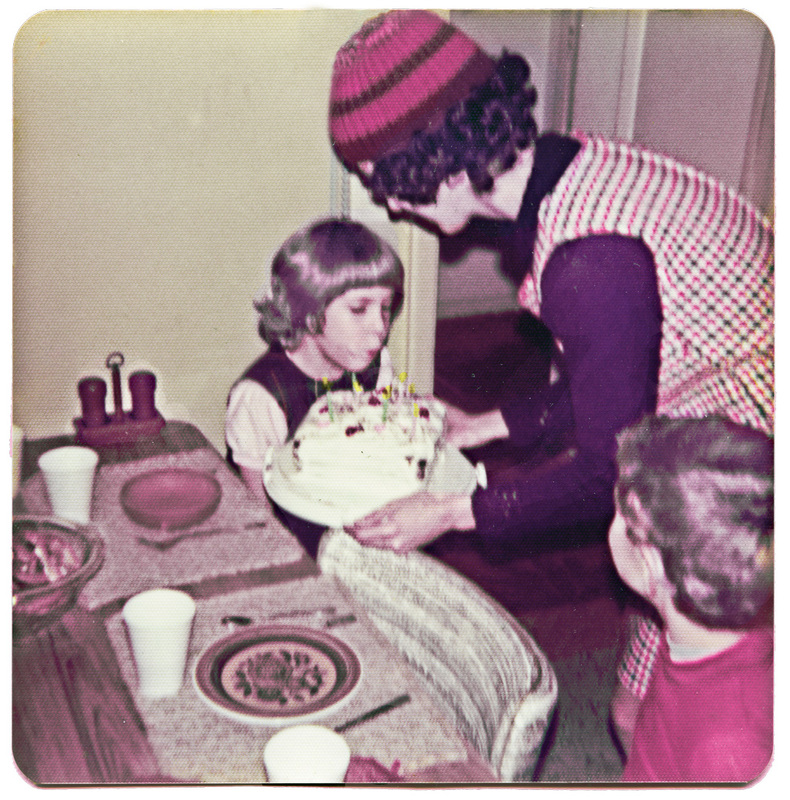 At Crista’s 5th birthday party I was wearing a knitted skull-tight cap, typical of the 1970s. 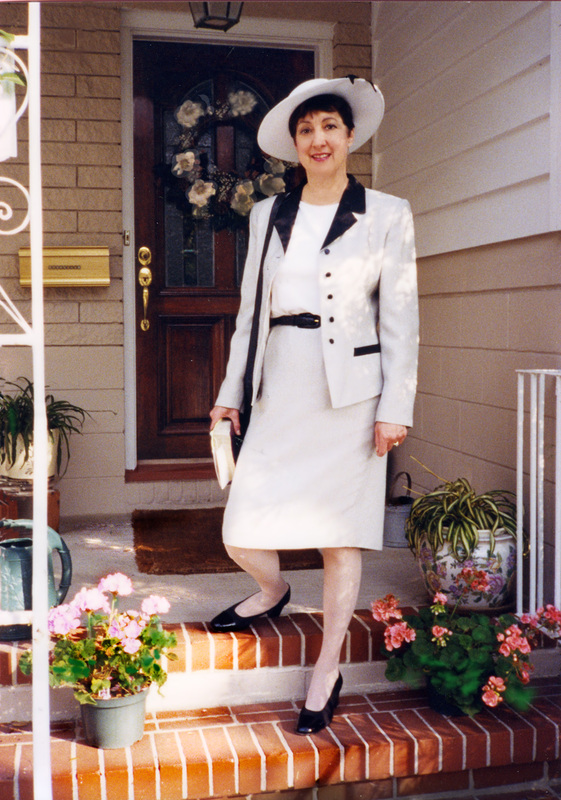 In the 1990s I bought a white hat trimmed in black ribbon and feathers, probably for Easter. I don’t wear hats anymore. I have already taken this one to Angel Aid, a charity for mothers and children. 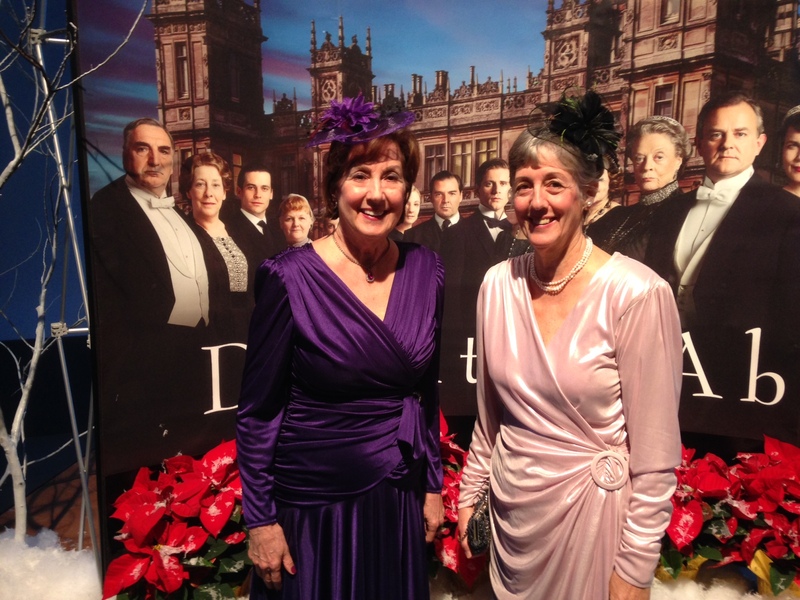 My sister Jan and I wore British-style hats to Downton Abbey events sponsored by our PBS station in Jacksonville, Florida. 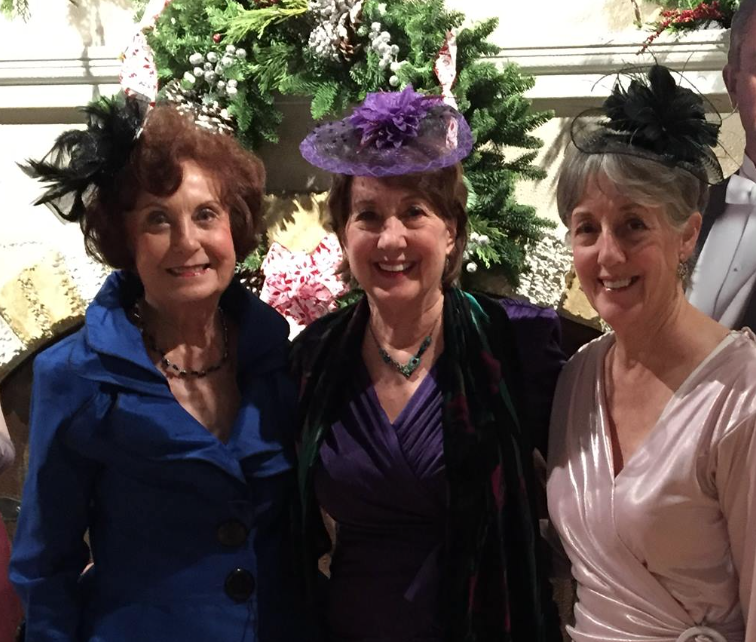 Each of our hats adorned with feathers, a flower and seed pearls cost $ 5.00 at Roots’ Country Market near Manheim, PA. We didn’t tell anyone at the gala how much our gorgeous hats cost. I’m following in the legacy of female civil rights leaders who completed their Sunday go-to-meeting clothes with fashionable hats. In June it will be two years since my mother died unexpectedly. I still miss her terribly. Grief occasionally comes over me in waves. Now less often, with less severe impact. Still . . .
On my dresser I have kept three mementoes of Mother, one on top of the other: the two-quart Ball jar with bubbles in the glass, emblematic of her love of cooking and canning. 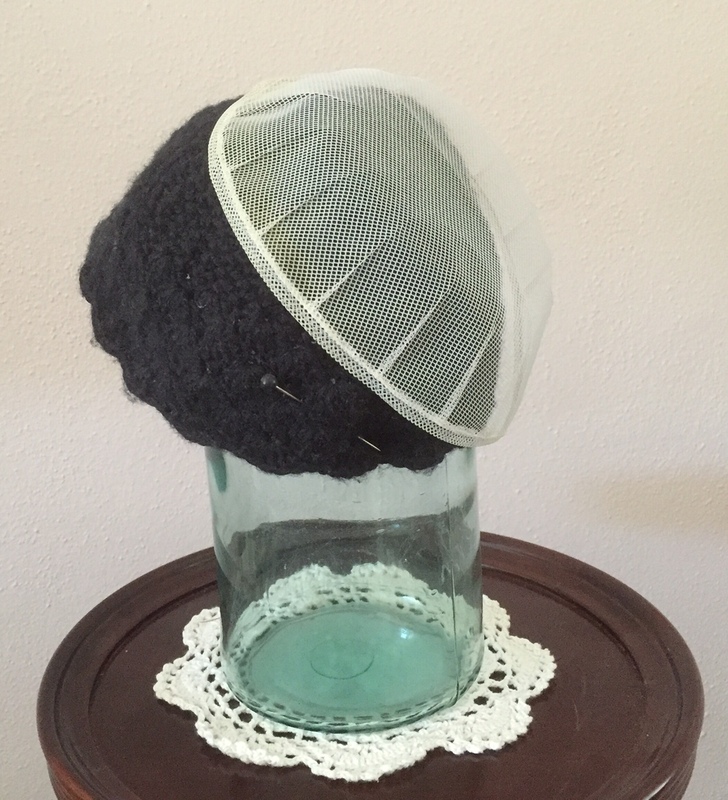 And her last Mennonite black bonnet and white prayer covering veiling made of bobbinet fabric, a see-through, hexagonal mesh. Symbols of her constant faith and hope in God, each piece of headgear is less than half the size of those she wore in her youth. What did it look like? Where did you wear it? Do you still wear a hat? Comments are warmly welcomed. Don’t be shy. Coming next: What Lights Your Fire? Next postWhat Lights Your Fire? I love the photos of you and your sisters in your hats, and you in your white hat and white and black suit! I believe you wrote about Harry the Hat, which sounds like a Dr. Seuss title. Someday you may showcase your wedding picture with the big blue hat on your blog. I have to wonder what poetic form it may take: triolet? villanelle? Thanks again for being my Wednesday morning greeting here. I have a few hats of different styles from flat caps to trilby’s to my top hat. I rarely wear any of them but it’s funny the only one I’m comfortable in is the top hat. I especially like you in the black and white creation that matches your outfit. Very smart. I had to look up trilby, which to me looks much like a fedora but with a narrower brim. I imagine you would look very smart with a top hat; it would certainly match your distinguished title – ha! You’re right about the trilby Marian and I prefer the fedora. As a nurse I especially regret the end of the nursing cap. I graduated from Grady Hospital School of Nursing in 1974 and wore my pleated Grady cap proudly into the early 1990s, after which caps were discouraged (as colored scrub suits replaced white uniforms). I SO agree about the demise of nursing cap, Lynn, which to me equated to the doctor’s white coat. Nowadays it’s hard to tell an RN from other nursing staff unless you squint to look at the ID on the lanyard. Thanks for mentioning this, truly another type of “hat”! 1. The little Mennonite shrine at the end of your post brought tears to my eyes. You could put it in your garden and create a grotto. But of course it belongs on your dresser to remind you not only of Mother but of all your own stages in a long and meaningful life. 2. Have your seen or heard of the musical Crowns? 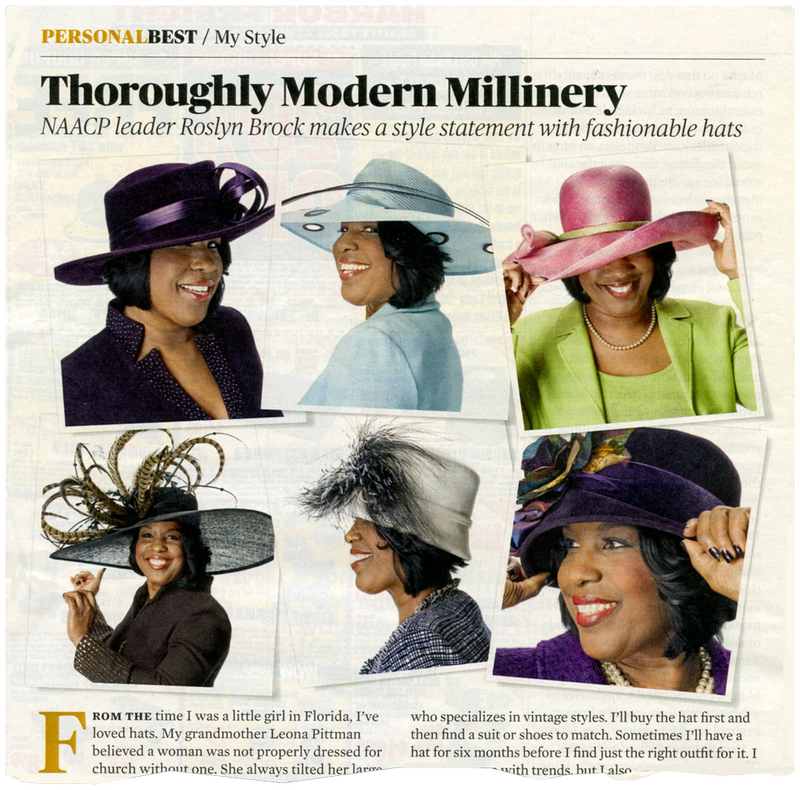 It tells the story of the meaning of hats to African-American women, especially to church-going ones. 4. My own hats? I have five in the closet. One a cloth cloche that daughter Kate helped me find and buy in Victoria, BC. Another white crushable one that I picked up in Greece and take to hot climates or the beach. A blue beret. And a few knit caps for walks in the winter time. I like hats. 5. Your memory writing about the little girls is exquisite. This is the kind of description that will attract readers, not only to this blog but to that great memoir you are constructing. This morning I learned about trilby and fascinator hats, both British. And now you mention Crowns, the Musical. I googled the site of course and saw positively dazzling hats – and women with lots of hattitude. It’s worth writing blog posts just to learn from our readers. Agree? About the hats from Roots. We didn’t buy any materials. The hats were ready-made with headbands, both at bargain prices. You look fabulous in that white and black hat and outfit!! I had a lovely hat made for me to wear at my daughter’s wedding. I loved that hat and planned to wear it again but the opportunity never arose. I sold it at a consignment shop before we moved to Span. I too have a fascinator a friend gave me for my birthday a few years ago which I wore to my birthday tea party, and here in Spain to an Ascot Day party. Of course, I have straw hats to protect my head and face from the sun. Your memories of your dear mother are perfect. You’re welcome – and thank you, Darlene! And I appreciate your reference to the fascinator hat, a version of which I think I’m wearing to the Downton Abbey gala. I had to look up the word and found that Princess Kate wore a fascinator when she visited Canada: https://en.wikipedia.org/wiki/Fascinator You are still a teacher, Darlene! I am a big fan of hats now, although it wasn’t always so. It wasn’t until I settled in England and winter hats were a necessity rather than a fashion statement that I got used to seeing myself in one and now I wear them in all seasons. My profile picture was taken at Monet’s Gardens in Giverny, France, 5 years ago and I still wear it: one of my most precious possessions. In winter I wear one of my crocheted hats. I also think hats are great at weddings, but I haven’t been to one in recent years. By the way, crocheting is a great travel hobby, with you wherever you go. Thank you. The setting of the photo is the famous Japanese gardens with the lily pads and the bridge: beautiful! Love the Downtown Abby pic. WE only wore Easter bonnets when I was a kid. Not many other times I would have kept a hat on my head. I agree, hat-wearing may be impractical for a woman with a whirlwind schedule like yours. I wore the Downton Abbey hat twice. Just today I found out such hats are called fascinators. Maybe one of your eccentric novel characters can wear one – ha! Marian, They used to call me “Susie the hat.” In college I always wore a black velvet floppy-bimmed hat with a red rose pinned to the brim. It gave me that “glam girl” feel, like Zelda with her F. Scott Fitzgerald – the man I dated at the time and whose love of “The Great Gatsby” was unequaled only to mine. Years later at my wedding when I married John, I wore a gauzy wide-brimmed white hat with large white flower . . . and many years after, when I traveled to Tucson as a widow and visited nearby Tombstone, my first purchase . . . yes, you guessed it . . . a straw wide-brimmed cowgirl’s hat. Wearing it made me feel part of the West and its adventuresome spirit. I always thought it sad when I would see the plain white caps the Amish and Mennonite women wore at the Farmers’ Market in Wayne, PA, where I grew up. Many had thick gorgeous heads of hair crammed under those caps . . . not allowing the beauty, the free spirit of the woman to shine . . . Hats say it all, especially if one is tall like you. Your hat history is fascinating, and so is your observation that cramming caps on top of thick hair is restrictive. Like you, I choose the free spirit. Thanks, Susan. Marian — You look like you could be stepping off the cover of a magazine in your white hat trimmed in black ribbon and feathers. Simply beautiful! The photo of you and your sisters brings to mind the Easter finery my sister and I got to wear to church on Easter Sunday. My favorite part of the whole outfit? Not the hat. Not the cuffed white socks and Mary jane shoes. Not even the white gloves. Mom would put Milk Duds in my little purse to keep me quiet during the service! Your free spirit was evident even then, Laurie. I love Milk Duds, but I never was given chocolate in church. Grandma Longenecker would have little red and black envelopes of Sen Sens. The black tidbits tasted like licorice and left a pleasing after-taste. You always find the perfect anecdote to go with the theme here. Thank you! I love the picture of you Jan and Jean. So beautiful. You look so good in all the hats you wear. I love hats. I just can’t wear them because I get a headache when I put anything on my head. When gardening I’m forced to deal with the pain if I want to enjoy the beauty of the flowers how beautifully placed are moms bonnets. Yes, still painful to know I can’t hear her voice or see her. We’re going to PA for a week in June first since her passing. I’m bracing myself. As always a great post. I wonder whether you could tolerate a sun visor when you’re gardening, Gloria. Just a thought. We visited PA in February and plan to go up again sometime in late summer. I always appreciate your comments here. We shared a Mother, that’s for sure. Such a lovely post Marian thank you! Lovely to read of your memories of mother and hats. Many or most African women wear something around their heads, a headscarf e.g. when working as a domestic. These can also be brightly coloured. And they have a way of wrapping scarves around their heads in a most attractive fashion. I don’t wear hats (though if I looked anything like you in your hat, I’d be a mad hatter immediately – gorgeous photo!) which is a bit nuts because our sun is quite severe. I have on occasion wrapped a beach scarf around my head because of the heat of the sun on my poor head, and the photo was quite fetching! I tried on fascinators pre my son’s wedding … you and your sister look trés glam. Am getting the greens here checking out those photos .. I enjoyed all the photos of your son’s wedding, including you looking very stylish. You strike me as very artistic, and I can imagine a fashionably wrapped scarf around your head especially during South African summers. I have never heard the expression “am getting the greens.” I assume it may have something to do with envy. Yes? Clever expression . . .
Oops I didn’t know the wedding photos were out there! Thankfully only very few of me, at least that I’ve seen. Now I’m going pale… never mind green. Getting the greens has been said by only me and only once I.e. in response to your gorgeous photos! Yes definitely, envious on a large scale! No worries, Susan. All in good taste. I may have seen some photos on Facebook. At any rate, I was happy to see a few scenes from the happy event. But NOT in sassy green boots – ha! When I was a teenager, back in the 1950’s, hats were in style. I wore one to church every Sunday. I don’t any more. My daughter, Pam, loves to wear hats and still does. I love hearing that your daughter Pam wears hats. Only 1-2 elderly women at our church wear hats any more. One even trims her own to match her outfits. It’s a lovely tradition, but apparently too time-consuming for our zippy lifestyles. The bonnet and starched (?) covering from your mother are indeed touching because of the intimate way they touched your mother. DNA all over them! I agree with Shirley that I detected some artfully crafted prose describing you and your sisters hats. Nice! Worthy of an English teacher and literature lover. 🙂 Great post. As for my hats, I have a straw purple hat to keep the sun off at the beach or in the garden that I got for about $3 at Food Lion about 2 years ago. I also wore a hat to our wedding–I think I let my little girls play with that one and if it is still in the “dress up clothes” box in our attic, it has none of its former starch. Editor and writer yourself, you are also an astute reader. Yes, the snippet under the little girl hat photo is an excerpt from my current memoir draft. I know I’ve seen a wedding photograph of you and Stuart. If I see it again, I’ll have to take note of the hat. Obviously, I have never shopped at millinery stores either. Mine are all of humble lineage, if you can call them that. Grocery stores and farmers’ markets don’t usually carry designer labels. You’d have to go to a consignment shop for that – ha! We wore hats on Easter Sunday! It is one of my more favorite memories, except the year when I got last pick of the hats among the three sisters and the hat I had to wear was a giant side brimmed hat that was not at all to my liking. Still, I love hats even now. I wore one on my wedding day and occasionally, when the urge strikes I wear something trendy during the winter months. I love your story. It’s so rich and reminiscent of simpler times. I’m glad this post prompted “hatty” thoughts. I have to wonder where you stand in birth order among your three sisters because you mentioned you “got the last pick of the hats.” You got it right when you mentioned the story, “reminiscent of simpler times.” Thank you so much for reading and commenting here. I admire the work you do on your own blog, Dorothy. I am the youngest of five! Wore nothing but hand-me-downs until I got my first job. I always remember a very particular dress … my mother made 3 to match … I wore all 3! I see a post now, “Recycling dresses & more.” You’ve got a lot of chutzpah now, Dorothy. No shrinking violet any more. Thanks for continuing the conversation here. Hats are to be celebrated but only when you choose to wear them, when forced you just want to chuck em. I was the only bridesmaid of my best friend way back in the early 80s . Instead of my friend choosing what I wore, she let me choose because she valued my opinion so much ❤️ Me being a hopeless romantic, chose a style of Scarlet O’Hara, complete with the most adorable hat. I loved it so much I refused to take it off, even when we had our meal . .. There were a few tears of joy shed that day I can tell you. Right I’m off up the loft. I adore your hat story and probably would feel the same about your showy hat. I remember I didn’t want to take off my Mother-of-the-Bride dress after Crista’s wedding because I knew doing that would end of the festivities for me. About being plain. Dressing plain was a big issue in my Mennonite culture. But after all these years, plain dresses and prayer caps have fallen by the wayside in my community. Yet I have still retained my faith: Trust in a loving God and in his Son Jesus. What is on the inside is far more important to me now than hewing to a strict dress code. As you mention, I like to look pretty too! You can’t attach a photo to the blog, but you could send it to me as an attachment on my email: marianbeaman@comcast.net If you do, I could feature it on my Facebook page where photos are always welcome. Your amusing stories always make me smile, Cherry. Cherry, I’m happy to say your bridesmaid “hat” photo is now posted on my Facebook page (search: Marian Beaman), and you have many admirers. I have directed them to this blog, so they can read your comment here too. Many, many thanks! I like to wear a black leather driving cap, winter or summer. Not necessarily because of a style–its a great way for me to keep my cell phone, glasses and keys tucked in upside-down so I don’t leave them at a restaurant. If you ladies are missing wearing hats–put on a nurse’s hat, watch Call the Midwife and scream along with the other PBS women. Thank you for the humor and truth here, one of which I witness daily, the other weekly when the show is on. Call the Midwife –Wheee! Sundays at 9 pm in our neck of the woods. I remember seeing your distinctive hats, most recently the ones you wore in Arizona. Such flare – and sassy boots to match! What a fun post, Marian! You’re so stylish, from childhood to adulthood. Who would have known that hats could document so much! Your ma is quite a pace-setter, with or without a hat. I seem to remember your wearing a hat, Marylin, perhaps a cowgirl hat on a blog post with a car. Either I remember this or I’m making it up – ha! Here’s to women who wear hats (or don’t!) for all the right reasons. And thanks for the compliment too. Hats! What a wonderful feminine accessory! I remember lots of straw one with silk flowers. Sometimes the straw was flexible and made a crunch when you tried it on. Also the little netting that flirted over your forehead added to the effect. I wish that I could try on the big circular straw hats that my ancestors wore in the fields of Germany! My favorite hat is a blue wool crocheted one made by my grandmother with a big crocheted flower on the side. It looks like a cloche. Yes, I remember when the mandatory church attire was white gloves, hat, dress, NO gum and a very demure affect! You may have noticed on my blog comment I promised to send a photo of my mother Ruth Longenecker’s Sunday School class at Erb’s Mennonite Church. Their teacher was Kathryn Bomberger, whom you or your mother may have known. Again, thanks for your lyrical blog comment today. Hat descriptions that I could both see and hear. What could beat that! Thank you, Ann. Those big circular hats worn in the fields of Germany appeal to me too. I want to send you a photo via email you may be able to relate to: my mother’s Sunday School class at Erb’s church with her teacher Kathryn Bomberger. No hats in the photo, but I wonder if Kathryn may have been a relative. This photo was on my Facebook profile page for almost a year after Mother died.Thanks again for posting here, Ann . . . so glad to have this connection. I love your hats, Marian, and the way they tell the history of a time and a life. I’m prone to practical hats–warm fleece caps in winter and large sun hats in summer. I’m so touched by what you keep on your bedside table. I have almost nothing from my mother, although I have things from each of my grandmothers in my bedroom. Of course, I can imagine how the waves of grief still come with surprising strength. I’ve noticed your hats, Elaine, signaling the cycling of seasons on your New York farm. The jar and bonnet shrine are on my dresser. If they were on my bedside table they would surely fall and break as I fumble during the night for cough drops, water, the clock . . . The grief “thing” sat dormant through most of the winter. Now it’s presenting itself full force. I bought dandelion at the farmer’s market and used mom’s recipe for a side dish this morning. That’s how I’m venting/releasing now. Thanks for keeping your finger on my emotional pulse, Elaine. My mother loved a hat and had many, from the little red cloche with pearls and beads (very 1920’s) to a Russian type fur affair. I think I’ve inherited her love because I have a lot of hats too, mostly very serviceable knitted affairs for winter and all a little quirky. It seems a shame the fashion for hats has passed. I can picture all the hats you describe – for me, the quirkier the better. Witness our fascinator hats! I would imagine that hats are a “must” in your climate, especially during winter walk-abouts. Thanks for stopping by, Marie. I’m afraid my life is currently devoid of hats, but you’ve inspired me to change that. I especially like your Downton Abbey get-up; you look like you could have wandered off the set! Ah, Rebecca, I like the idea of being an extra on the set of Downton Abbey. As you know, our hats were cheap as dirt, but so ornate. Because of the comments here, I learned the word Fascinator, the proper name for this distinctively British headgear. Maybe Sage can help you pick out a hat, Rebecca!